Today is Poland’s National Independence Day. I and another Jewish Fulbrighter are going to a synagogue this afternoon, where there will be a special service of “prayers for Poland” before the regular Shabbat services. I just have to finish proofreading this article first. Attribution: Wikimedia Commons. That's the Tomb of the Unknown Soldier in the background, here in Warsaw..
Here’s the beginning of Wikipedia’s explanation of the holiday, which I have shortened a bit for this blog, and why on it’s November 11. I do not wish to in any way soften the enthusiastic tone of the article. There are so many memorials, both in the calendar and around the country, to times of great suffering; this is one of the celebrations. National Independence Day (Polish: Narodowe Święto Niepodległości) is a public holiday in Poland celebrated every year on 11 November to commemorate the anniversary of Poland’s assumption of independent statehood in 1918 after 123 years of partition by Russia, Prussia and Austria. Autumn 1918 marked the end of World War I and the defeat of all three occupiers. Russia was plunged into the confusion of revolution and civil war, the multinational Austro-Hungarian monarchy fell apart and went into decline and the Germans bowed to pressure from the forces of the Entente. For Poles this was a unique opportunity to reclaim their national way of life. Following defeat of the occupying forces, the Poles began to seize military and civil power, building the foundations of their future nation. On the nights of 6 and 7 November the Provisional Government of the People’s Republic of Poland was formed in Lublin under the supervision of Ignacy Daszyński. …Józef Pilsudski returned to Poland. He had been imprisoned since July 1917 by the Germans. On 10 November 1918 he arrived in Warsaw. His arrival was enthusiastically met by the population of the capital and saw the mass disarmament of the occupying forces across the whole of Poland. On 11 November 1918 the secret departments of the Polish Military Organisation, demobilized soldiers, legionnaires and young people, disarmed the Germans in Warsaw and other Polish towns. The Regency Government appointed Józef Pilsudski Commander-in-Chief over the Polish Forces and three days later Pilsudski was given complete civil control. 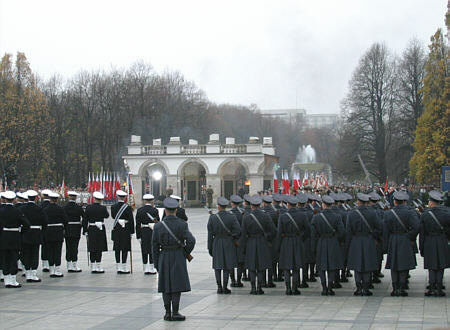 After World War II the Polish People’s authorities removed Independence Day from the calendar but the reclamation of independence continued to be celebrated commonly on 11 November. In 1989 the 9th term of the Sejm government restored the official holiday.